"The thing I love about dealing with prints at the top level is that you don't have to make compromises—you can buy Art History 101," says Armin Kunz, the New York director of the venerable C.G. Boerner Gallery, which deals in Old Master, 19th-century, and modern prints. "Few people can buy a Rembrandt or a Dürer. But if you buy Rembrandt's Three Crosses [a 1653 etching], you are getting one of his most famous artworks." One impression of the print, of which about 80 are known, sold privately a few years ago for a reported $1.5 million. Christie's London sold one in December 2006 for £467,200, or just over $915,000. The market for prints by well-known Old Masters has been small for some time, but not for lack of buyer interest. "It's totally dependent on the scarcity of supply," Kunz says. "Whoever has the supply has the upper hand. The greatest thrill is not the sale; it's getting the material on consignment for sale." Prints are the bonds, not the stocks, of the art market. Their prices generally rise over time but, with very few exceptions, they don't fluctuate wildly. Even in the current buoyant market, there are few signs of an emerging bubble in prints, experts say. "You can't expect to sell a print at a profit 15 minutes after you buy one," says Alexandra Schwartz, the director of Pace Master Prints in New York. "But if you buy the right print, you can sell it if you're patient enough." While it's hard to make generalizations—many variables affect prices over time—high-quality prints usually hold their value, according to Schwartz, and may do much better than that. Traditionally, fine prints have appealed to new art buyers with limited resources as well as to committed collectors who are pursuing the gamut of works made by favored artists. But in recent years, with the very best paintings fetching record-breaking prices that place them beyond the reach of all but the top 0.1 percent of buyers, prints have been getting a second look from a broader range of people. Collectors are learning that prints may be the best way to purchase distinctive images by well-known artists, and that many artists devote considerable effort to making important, highly desirable works in print mediums. Moreover, in the world of online art sales, prints have been a success story. Prices in many print categories—particularly works made after World War II and iconic images from earlier eras—are showing strength at auction yet remain relatively affordable. Adam McCoy, the senior print specialist at Christie's New York, characterizes the market as "robust," adding, "Overall, the market for contemporary prints shows the most significant growth from season to season." McCoy points out the historical strength of single-collection or single-artist sales, citing as an example last February's auction of 38 etchings by Lucien Freud from the archive of his printer, Magar Balakjian. The prices realized by Freud's prints ranged from £10,000 ($15,700) to £145,250 ($228,000). "Many collectors are looking to the print market for works that cost just a small fraction of what they'd have to pay for a painting," says Mary Bartow, head of the prints department at Sotheby's. On May 22, Sotheby's London sold a complete set of Andy Warhol's 10 color screenprints of Mao, 1972, for £1.6 million ($2.5 million), more than triple the high estimate of £500,000 ($791,000) and a world auction record for a print or set of prints by the artist. Two weeks earlier, Christie's New York sold a large untitled monotype (image 303/8 by 901/8 inches, sheet 38 by 97 inches) from 1983 by Jasper Johns at its postwar day sale for nearly $1.5 million against a $600,000-to-$800,000 estimate. A monotype is a unique work—essentially an edition of one. Yet the price was still far below what a painting of such size would fetch. Signed prints in large editions by masters like Johns and even Picasso can be found for prices in the low five figures. Even an instantly recognizable work by a father of modern art can be had for that price. In her spare Manhattan office overlooking East 57th Street, Schwartz displays a small, colorful picture of bathers, with trademark fluid figures and characteristic tint of blue. 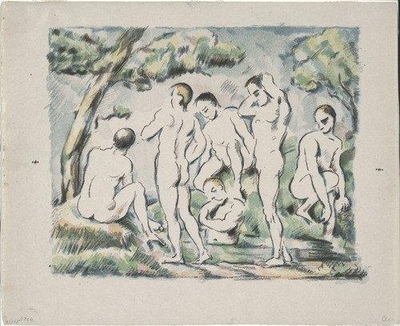 This Cézanne, Les baigneurs (petite planche), which even up close has the freshness of a watercolor, is one of 100 impressions printed for the artist in 1896 by the master lithographer Auguste Clot, who in the late 19th century also worked with Bonnard, Degas, and Vuillard. The price? Just $35,000. Nearby hangs an aquatint by Picasso, a portrait of Françoise Gilot, dated 1947 and priced at $75,000. "It's spontaneous, full of light, full of life," says Schwartz. Of course, not all works by Picasso are so affordable. 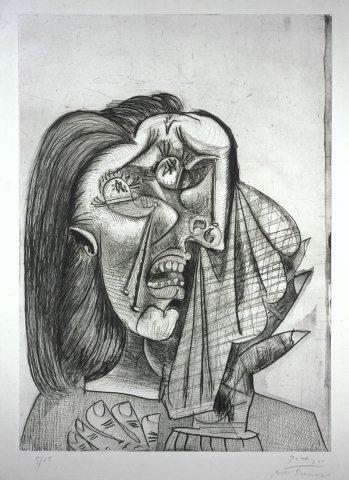 Consider the sale at Christie's in November, 2011, of his Weeping Woman I, a drypoint with aquatint, etching and scraper executed in 1937. "That had everything—the right artist, the right image, and scarcity," says Schwartz. "It's one of his greatest prints, and there are only 15 impressions. It's signed and dated." Weeping Woman I sold for just over $5.1 million, blowing away the presale estimate of $1.5-to-$2.5 million. It was a world auction record for any single print. Generally defined as images made on a surface that is inked for transfer to another surface, prints are made in editions, a set of identical images or "impressions." The prints are numbered once an edition is completed. A limited edition print indicates that the artist will issue no more impressions, a promise usually secured by striking an X through the plate to make further prints impossible. As with photographs, scarcity generally affects pricing: The smaller the edition, the greater the perceived value. The spectrum of processes includes woodcuts, engravings, wood engravings, etchings, aquatints, lithographs, silkscreens, linoleum cuts, archival inkjet prints, and more. Print terminology can be daunting, even confusing, to newcomers, and it encompasses not only the process but also the type of paper, the printer, the image size, the printer's stamp, and additional details. Glossaries and other basic information can be found on the websites of the International Print Center and the International Fine Print Dealers Association, which will present its annual fair November 1 through 4 at the Park Avenue Armory in New York. But collectors don't really need to know the fine points of each process. It's not as if all lithographs are better than all etchings, or vice versa. "There's no hierarchy of medium," Bartow says. Even dealers sometimes use terms loosely. "We use 'print'; some dealers use 'lithograph' and so on," Schwartz notes. During medieval times, prints, principally woodcuts, served such popular purposes as the production of playing cards and inexpensive religious images. The fine print arose during the Renaissance, with master engravings by Antonio del Pollaiuolo (only one survives) and Andrea Mantegna in Italy and Albrecht Dürer in Germany. Art historians credit Dürer's 1513–14 trio of master engravings—Melancholia I; Knight, Death and the Devil; and St. Jerome in His Study—with establishing the print as an independent fine art object. Prints by Rembrandt and Goya are among the most sought-after today. As with any medium, historical periods come in and out of favor. Prints from the 17th and 18th centuries, for example, have been out for a while. This past May, however, Boerner staged a widely admired exhibition of 17th- and 18th-century engravings by members of the French Academy at Pocket Utopia, the one-time space in Bushwick, Brooklyn, that reopened on Manhattan's Lower East side in collaboration with Boerner. Kunz says that some contemporary artists and dealers, including Richard Tuttle and Jack Tilton, took a fancy to the works. "Now I've become a great champion of what I call 'Frenchmen in wigs,'" Kunz says. "These prints were in high demand at one time," but the most expensive print in the show was priced at $2,500. David Tunick, a veteran New York specialist in fine prints and drawings, recently drew enthusiastic audiences to an exhibition (May 3–August 17) of some 60 etchings by the 17th-century artist Giovanni Benedetto Castiglione, supplemented with prints by the artist's contemporaries and figures he later influenced, Claude, Piranesi, and Tiepolo among them. "Most people go for the recognizable, what I call the 'wow' factor," Tunick says, "and the 17th-century doesn't offer that beyond Rembrandt." But there are "tremendous opportunities for collectors," he adds, noting that the climate is changing as the auction houses are more inclined to include prints in their more "glamorous" evening sales and as more collectors understand that prints have been as important as painting to certain artists. Prints from the 19th century are also market laggards at the moment. Prices soared along with Impressionist paintings during the height of Japanese buying in the 1980s and early 1990s, then dropped with the entire art market. They have not fully recovered. Some prints by Vuillard, Bonnard, and Toulouse-Lautrec today fetch just a few thousand dollars. In the early 20th century, many Austrian and German Expressionists—Ernst Ludwig Kirchner, Käthe Kollwitz, Emil Nolde, and Egon Schiele—were master printmakers, and their works currently are in demand to the same high degree as Expressionist paintings. Jane Kallir, a director of Galerie St. Etienne, the highly respected New York gallery that specializes in Expressionism, sees the market for Expressionist prints growing not with the discovery of neglected talents—the field is too thoroughly researched for that—but with the recognition of the broader output of established masters beyond their iconic works. 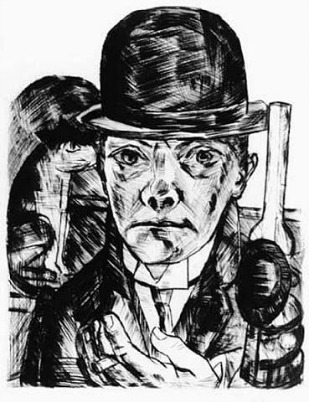 For example, Galerie St. Etienne currently has one of Max Beckmann's best-known prints, Self-Portrait in Bowler Hat, 1921, a drypoint that commands a price over $100,000. The gallery has another Beckmann drypoint from the same year, Merry-Go-Round, which is priced at $12,000. It is, Kallir says, "just as satisfying and just as rare." But the first Beckmann became "canonical" through frequent reproduction; hence its desirability. Kallir also points out a fresh, "fantastic," and—yes—rare lithograph by Kirchner, Two Girls Bathing (Decorative Study), 1911, one of only two known impressions. It's "counterintuitive," Kallir says, yet possible for a print to be "too rare," and therefore difficult to sell. Given their aesthetic of spontaneity, uniqueness, and monumental scale, the Abstract Expressionists mostly ignored printmaking. (Prints by Robert Motherwell, the great exception to the rule, are on view at Bernard Jacobson Gallery, in London, through October 6.) The late 1950s and 1960s witnessed a turnaround with the emergence of Pop art and Minimalism. Robert Rauschenberg, Richard Hamilton, Johns, Warhol, Roy Lichtenstein, Sol LeWitt, Frank Stella, and others injected fresh energy into graphics. New master print studios emerged, notably Universal Limited Art Editions, in New York; Marlborough Graphics, in London; Crown Point Press, in San Francisco; and Gemini G.E.L., in Los Angeles. Fifty years on, these storied presses are working with the likes of Tomma Abts, John Baldessari, Ellsworth Kelly, Richard Serra, Amy Sillman, Kiki Smith, and Fred Wilson. In Bucks County, Pennsylvania, the younger Durham Press has produced editions by Joe Amrhein, Polly Apfelbaum, Beatriz Milhazes, James Nares, and Mickalene Thomas. Milhazes has combined silkscreen and woodblock techniques, among other processes, in the course of several years of working with Durham Press. At New York's James Cohan Gallery, Milhazes's prints sell for $60,000 to $70,000—about double the price of 15 years ago—compared to about $1 million for her paintings. Cohan is co-founder of the VIP Art Fair, which launched in 2011 and, last spring, debuted the print-heavy VIP Paper fair. VIP lives online, as do such selling sites as Artnet and Artspace, and Paddle8, which directs online shoppers to participating galleries. Chris Vroom, the cofounder and chairman of Artspace, describes prints, photographs, and other multiples as "a great on-ramp for emerging collectors" and notes that his own first aquisitions included Francis Bacon lithographs. Speaking of all mediums, he makes the case that the online site, which launched in March 2011 and is approaching one million visitors, "indisputably broadens" the market by providing education and information while offering collectors at all levels the option "to buy with just a few mouse clicks." Among the bricks-and-mortar galleries that specialize in contemporary prints, perhaps none has made more vigorous use of the web than the 29-year veteran Seattle dealer Greg Kucera. Citing the value of "visibility and transparency," Kucera has a full-time employee devoted to overseeing the gallery's own site—where all works are illustrated and priced publicly—and monitoring how gallery works are represented on the websites Artnet, Original Prints, and—in the near future—1stdibs. Kucera, who speaks with pride of sustained client relationships, reluctantly accepts the anonymity that accompanies online selling. That anonymity, according to McCoy of Christie's, can be a boon to buyers. "Many of our online-bidders are new clients," he says, "but because they are able to participate from the comfort of their home or office, they bypass the intimidation of the auction process. Furthermore, they are savvy from the broad amount of information available. " Print collectors have long been advised to develop "an eye," to compare impressions, and to haunt exhibitions and auction rooms. Time will tell how online "information" holds up against the first-hand experience of prints.Either way, the future of prints looks bright. Many contemporary artists have embraced printmaking, drawn by the ability to experiment with techniques and to work across disciplines. Twenty-first century technologies, like three-dimensional printing, are opening new possibilities. The prints that collectors buy now may come to be as highly prized as the first fine art prints made 600 years ago.